We design under international standards and certifications CEPREVEN, UNE 23500, EN 12845, NFPA 20 y UL/FM in compliance with international standards in terms of design and safety, such as CEPREVEN, UNE 23500, EN 12845 y NFPA 20. We also offer listed equipment UL/FM through cooperation agreements with other manufacturers. 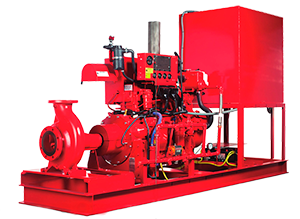 Incorporating different types of centrifugal pumps as well as combinations and models of electric motors and diesel, allow us to cover a wide operating range, with flows up to 5000 GPM. Considering the composition of the extinguishing agent, we also offer solutions based on different materials such as GG25, GG40, AISI 304, AISI 316, Bronze, Duplex, Superduplex, etc. This variety of designs, combinations, operating ranges and materials allow us to respond with great flexibility, being able to adjust to the design criteria required for each installation, always under strict compliance with international standards and regulatory frameworks established safety. All our equipment’s are built with control panels for electric groups and diesel, design and own manufacturing, a large number of configurable parameters groups according to the requirements demanded in each installation and customer, in compliance with the regulations of design and safety more restrictive thus offering reliable operation of the pressure group at all times.